Getting children to eat healthily does not have to be a chore, as long as they grow up with a varied and healthy diet. After all, if eating well is normal to them, there are far fewer reasons for them to turn their nose up at cabbage or cauliflower. 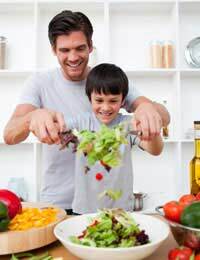 One of the best ways to get children interested in healthy food is to encourage them to help you to cook. Even young children can get involved with cooking – there is plenty they can do without flames and knives when they are younger. Children love to get messy, so when cooking with them, remember this. You do not have to splatter food around the kitchen to allow them to get a little bit messy but if you put them in an apron and hat, they’ll love getting hands on with food. One of the most satisfying things you could make with young children is a pasta sauce such as pesto. A really rustic version will not even need a food processor and children will love helping to bash together the ingredients to make the sauce. The beauty of something like pesto is that from making it, children will really learn about ingredients and which ones taste which way. You can have them taste it halfway through and decide to add more basil or cheese and they will really feel as though it is all theirs – handy when it comes to encouraging them to eat it as well. If you cook with kids a lot, the chances are that they will soon want to move onto something a touch more advanced than a no-cook sauce. But this is where you can really nurture a passion for food, tastes and a real variety of fruit and veg. And what’s more, you can do it with foods which are not always considered the most healthy. But if cooked in the correct manner, even ‘treat’ foods like pizza can be healthy. Children will have great fun helping to knead the dough for the base of their pizza and watching it can shape and colour when it bakes. And when it comes to the topping, let their imagination run wild. If they want four different colours of pepper to make it bright, then let them – the more variety, the better. The key thing to making cooking fun is making it inclusive. Rather than shooing children away while you rustle up something for their dinner, get them to help. Whether it is throwing beansprouts into a stir fry or tasting a sauce to determine what is needed to make it perfect, children love to feel useful. And the feeling of usefulness will hopefully translate into a passion for good and healthy food. Food is fun and children should be encouraged to find this out for themselves. By learning about good tasting food and what goes into their food, children should be attracted to eat well – hopefully for the rest of their lives. Of course, there will always be some times when they turn to junk, but if they enjoy cooking from scratch they will hopefully realise food is far better when you know what is in it.